While Christmas shopping at the Annapolis Mall with my mom, we happened upon The Last Crumb, an adorable little cupcake kiosk. Part of the larger smoothie kiosk, Smoothie Sensations, the owner’s wife bakes cupcakes to be sold on weekends. (Because this is a one-woman operation, which her husband supports, she currently does not have a website.) Luckily, we were there on a Sunday and they had a decent selection of mini and full-size cupcakes left for us to choose from. 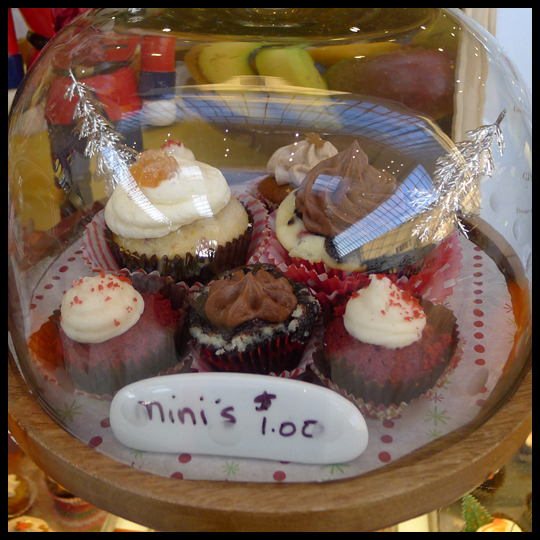 The set up was playful and cute, with a glass case and covered cake stand, and the staff were very sweet and helpful. I LOVE minis, so I bought every mini flavor available (and at only $1 per mini, that is a deal too) and one full-size cupcake, that was not available as a mini. This cupcake was the only cupcake I would not order again and was also the only full-size one I ordered. Since there was not much of a description, I assumed this cupcake would be very sweet and taste like cotton candy, sadly it was neither sweet nor cotton candy tasting. The cake was vanilla, but that wasn’t the issue, its dry, brittle texture and lack of flavor was its undoing. The icing was sweet, but tasted simply like confectioners sugar. 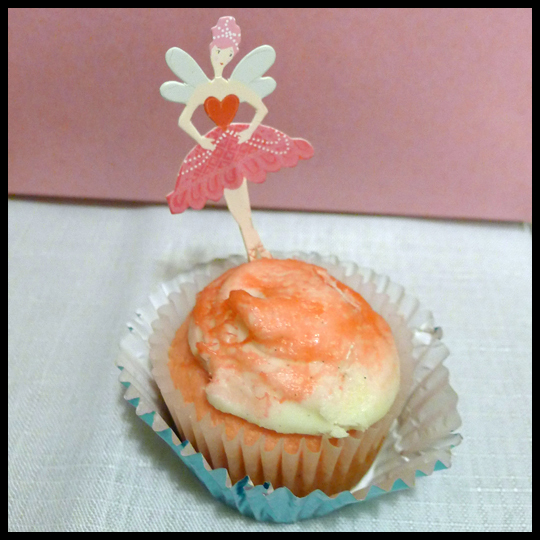 The melted cotton candy on top may have given this cupcake some more flavor if there had been more of it. Overall, this cupcake looked beautiful and whimsical, but didn’t have much taste at all. 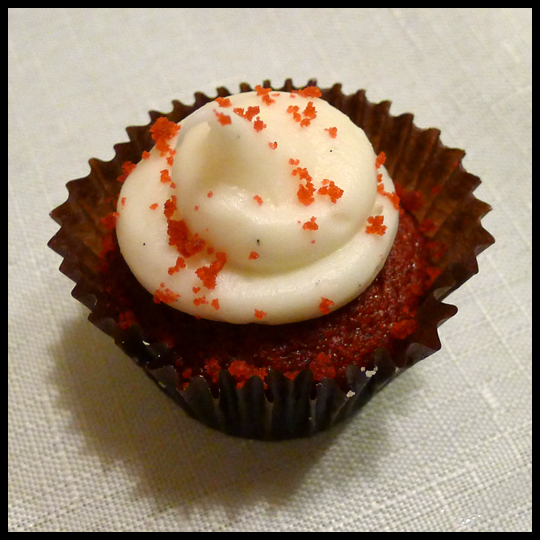 Being the Red Velvet Crusader, I almost HAVE to get it – this little mini red velvet was very good. The icing was a vanilla buttercream, not the standard cream cheese icing, and had vanilla beans swirled through, creating a beautiful look. The bright red cake was a little dry, but had a great flavor. I would be very interested in trying their full-size red velvet to see if it was slightly better, being larger and able to hold onto more moisture within the cake. This little mini packed a PUNCH of flavors! 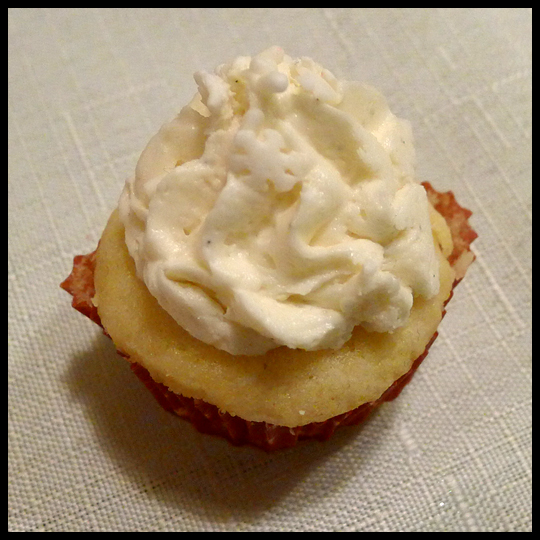 While the cake was a moist and savory almond flavor, the icing was a vanilla lemon buttercream. 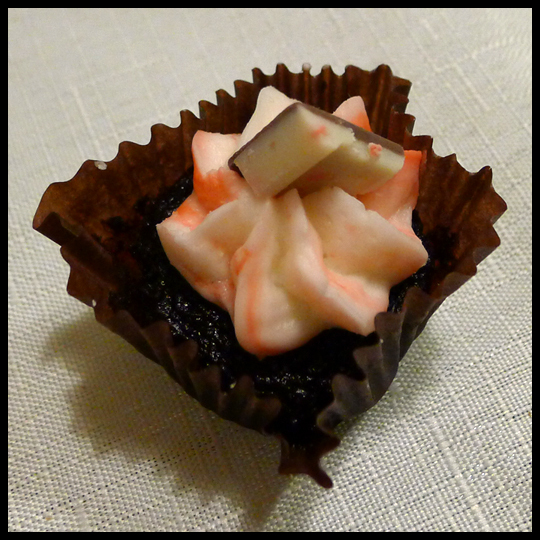 These complex flavors worked very well together, but apart, the icing was just a bit too sweet for my taste. I really love almond cake and this cake was amazing. Moist rich chocolate cake and cheesecake topped with chocolate mousse icing that was smooth, creamy, and not too sweet. Black bottoms are always a good idea, and this one had something extra. Maybe it was the icing, maybe it was the fact that it was a perfectly moist little mini: whatever it was, I wish I had gotten a regular size cupcake of this flavor, and plan on getting one the next time I am at Annapolis Mall. Because it was around the holiday season, The Last Crumb had some great holiday flavors available. This little gingerbread did not disappoint! 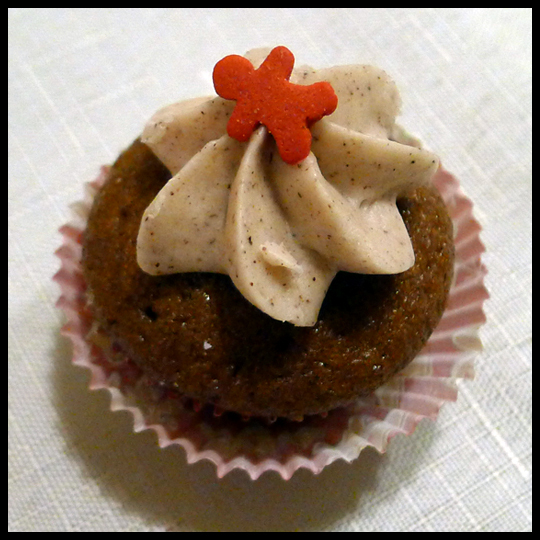 The spiced cake AND icing might be a bit much for some people, and maybe a full-size cupcake would have been too much, but this spicy mini is perfect for me. I loved the true spice cake that revealed a different spice flavor with each bite. Add the spiced buttercream icing that was smooth, sweet, creamy, and of course spicy, and this gingerbread mini really shined. 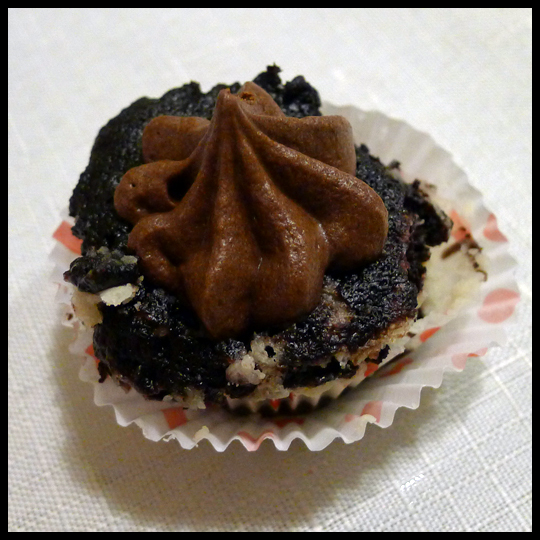 This tiny morsel of a cupcake left me wanting more! Between the incredibly moist and rich chocolate cake and the swirling, smooth peppermint icing, this cupcake really embodied its flavor profile. The chocolate peppermint bar on top was just an added bonus. I’m not huge on chocolate cake, but this cake in particular is one of the best I have ever had. All in all my cupcake experience with The Last Crumb was a great one! I would really like to go back and get some of the mini cupcakes in full-size to test their moistness, as none of the minis were dry, but the one full-size cupcake was. It amazes me that this woman comes up with these flavor combinations, in mini and full size cupcakes, just for fun on the weekends. I would definitely recommend stopping by on a Saturday or Sunday to get some bite-sized cupcake treats! This entry was posted in Cupcakes, Maryland and tagged Almond, Annapolis, Annapolis Mall, Black Bottom, Cupcake, gingerbread, mini cupcakes, peppermint, Peppermint Chocolate, Pink Cotton Candy, Red Velvet, Smoothie Sensations, The Last Crumb by Crusader Elisa. Bookmark the permalink.